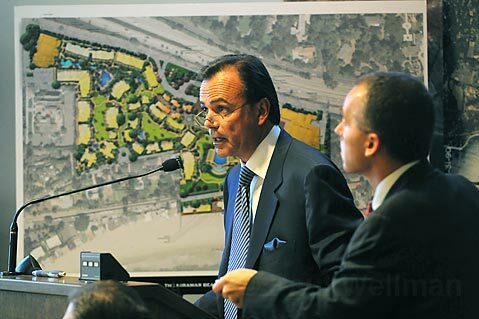 Developer Rick Caruso‘s Miramar Hotel renovation project won conceptual approval from the Montecito Planning Commission, after more than a year of wrestling among residents over the particulars of plans for the seaside resort. The unanimous vote of confidence capped a Thursday, August 28 hearing that lasted seven full hours despite Caruso’s request that his supporters merely stand to show their strength rather than take to the public microphone yet another time. 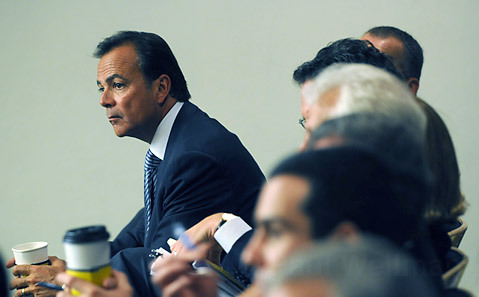 Caruso began the day by presenting last minute alterations – which the potential City of Los Angeles mayoral candidate said resulted from his listening to the community, and which he described as “bold” – that went beyond mitigations the commissioners had asked for. He reduced the number of rooms from 204 to 192. He re-did the parking analysis by doubling the estimated number of employees from the industry standard of 0.9 per room to twice that many, and still found there would be no significant impact on traffic, according to the County of Santa Barbara’s own analysis of nearby intersections. He also added 50 parking places. He noted that the Biltmore has “more rooms, and 100 fewer parking places than our plan.” Caruso’s team also eliminated all of the second stories from the Jameson Lane setback by moving two buildings back, completely removing the second story from another building, and rendering yet another second story invisible by removing and lowering parts of it. At the end of the day, Caruso added that if the commissioners would approve the project, he would promise to invest the hundreds of hours it would take to redesign the cottages in keeping with a description penned by planner Nicole Mashore, and much admired by the rest of the commissioners. In between, the commissioners agonized over a number of problems that are incompletely resolved, including neighbors’ fears that grade changes on the Miramar property will cause flooding in the creek adjacent to their own property. The Caruso team is in essence filling in the flood plain on the Miramar property and at least one engineering analysis, commissioned by neighbors, predicted that this would create bank overflow by forcing more water into a narrower channel. That analysis contradicted another analysis by county Public Works, and the commission ultimately came to the uneasy consensus that Public Works was probably right; that’s because the water is not actually detained in that section of channel, so it would flow quickly through, meaning the only effect from the Miramar development would be a three-quarter inch rise in the creek level. 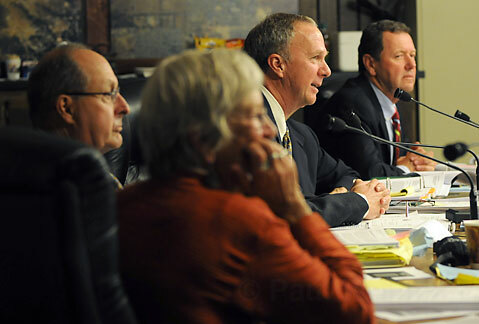 Montecito Planning Commissioners Claire Gottsdanker, Jack Overall, Bob Biereg, and Michael Phillips. County legal staff as well as Caruso’s team were mindful of the fact that the Citizen’s Planning Association (CPA) Executive Director Naomi Kovacs and two of the organization’s attorneys, Marc Chytillo and Ross Campbell of the Coast Law Group, were in the audience, and looking for evidence to support a legal challenge to the Miramar project. The CPA objects to the fact that the project has not received environmental review, having slid in on a negative declaration back when Ian Schrager, and then Ty Warner started renovating the Miramar in close adherence to its historic footprint and design. The CPA has argued that since Caruso is not renovating the historic structures, but razing them in order to create larger hotel rooms, a full Environmental Impact Report (EIR) is called for. The organization has also objected that the county’s executive office pressured planning staff to give short shrift to environmental analysis. The Montecito Planning Commission had already decided against a full EIR, but the CPA’s lawyers today argued for a Supplemental EIR – a less stringent analysis – calling attention to not only the flooding question but also Montecito’s recently declared water deficit, and the danger of soil liquefaction under at least a portion of the property. Those are all examples, they said, of issues that merit more study. But an SEIR would take another nine months at least, a delay Caruso has previously indicated would cause him to simply walk away from the ruin which the Miramar has become, to the dismay of many Montecitans. If the commissioners felt they could not approve the project without an SEIR, he asked them to simply deny it so that he could appeal to the county Board of Supervisors, whose members were expected to follow the lead of First District Supervisor Salud Carbajal in approving the project. On Thursday, the consensus was that, on the main points, nine months of study would not tell them much more than they already know. They deemed the liquefaction issue resolvable through existing technology, and not something that should stop the project. 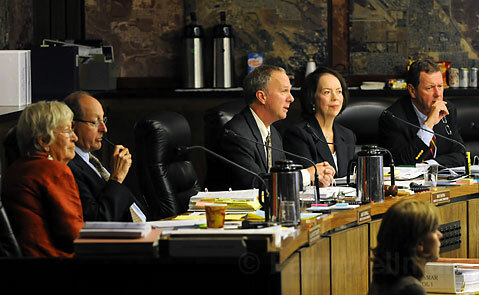 Comissioners also decided, after some indecision, to include two parcels – the so-called “sandy beach” parcel that borders the ocean and the Union Pacific parcel that the train runs through – in its computation of required outdoor space, known as floor-to-area-ratio or FAR. They did so partly at the advice of county counsel, to be on the safe side of any challenge that they hadn’t demanded enough outdoor space, though they noted that, even without it, the project met Montecito Community Plan standards. Water District Director Tom Mosby, called down from his Montecito offices to the downtown Santa Barbara meeting to address these and other questions. He assured commissioners that he considered the Miramar an existing customer, entitled to 42 acre-feet annually based on historic use, which he said amounts to a reasonable percentage of the 7,216 annual acre-feet Montecitans use – and overuse – annually. Mosby said that he issued the “can and will serve” letter granting district water rights to the Miramar only after consulting thoroughly with the Caruso team to determine the project’s true water needs and imposing certain water-saving conditions. That, however, only accounts for the Miramar’s indoor use. The district is still working on an outdoor use agreement, which Mosby estimated will be for about 51 acre-feet annually. It would have been more, he said, if Caruso hadn’t agreed already to cut down on the amount of water-sucking lawn he intends to install. Historically, the Miramar has not used any district water for irrigation because it has its own well. Caruso is not going to use the well, Mosby said; he has instead opted for district water to irrigate his landscaping. This fact is a point of irritation for some critics of Caruso’s project, who demanded – to no effect – that Caruso then deed his underground water rights to the district, as agricultural users have done in the past in exchange for metered water from the district. If it turns out that the Miramar is using too much water, Caruso told the commissioners, then he will take extra steps such as using reclaimed water for irrigation and locating laundry facilities offsite and out of the district. Commissioners said they wanted to make that a condition of approval, along with a few other other conditions which staff will write up and return with for the October 8 meeting. The main decision left to commissioners is whether to ramp up the number of events the Miramar may host, as well as the number of beach club members it may have, with more added every six months so long as parking and traffic problems emerge. Or, alternately, should they let him start at full throttle, as he requested (with 4.7 events a day and 300 members) but reduce the numbers if it proves to be a problem. After the decision, Kovacs said the CPA has not decided how it will respond. “It is disappointing that there is not environmental review,” she said.